"Speaker after speaker at this week's Republican National Convention defended small towns from the perceived slights of urban elites," Peter Wallsten and Doyle McManus write for the Los Angeles Times. "Cultural affinities, which President Bush played on heavily to paint 2004 Democratic nominee John F. Kerry as elite and out of touch, are now central to the campaign strategy of GOP presidential nominee John McCain." The Arizona senator "is an unlikely standard-bearer for the forces of family values, given his admissions over the years of his failures as a husband, or for the advocates of small-town living, with his millionaire wife and multiple homes," Wallsten and McManus write, but the strategy was confirmed by McCain's selection of Alaska Gov. Sarah Palin, " who cast herself as a symbol of small-town values." While the strategy worked for Bush in 2004, "Its effectiveness this year is uncertain," the Timesmen write. "Democratic voter registration has surged in several battleground states, and voters worried about the economy say they generally favor Democrats over Republicans. The economy, rather than any cultural issues, consistently ranks highest among voter concerns." But Republicans are trying to exploit Obama's remark to California donors about small-town voters clinging to religion and guns. The Times notes this line from Palin's convention speech: "In small towns, we don't quite know what to make of a candidate who lavishes praise on working people when they're listening and then talks about how bitterly they cling to their religion and guns when those people aren't listening." Obama "will combat the attacks by visiting economically depressed areas," write Wallsten and McManus, the newspaper's chief political writer and Washington bureau chief, respectively. (Read more) Those are likely to include the Appalchian parts of battleground states; Obama is scheduled to hold a town hall meeting at the high-school gym in Lebanon, Va., in the heart of southwest Virginia, Tuesday at 4:30 p.m. UPDATE, Sept. 7: "Some political analysts believe the Appalachian vote could determine whether Obama or Republican John McCain will carry Virginia and grab its 12 electoral votes," The Roanoke Times reports. Groups fear impact of adventure tourism in Ky.
Sportsmen and environmentalists don't always see eye to eye, but their leading groups in Kentucky both question plans for expanding adventure tourism in the state. Lt. Gov. Daniel Mongiardo is trying to develop a state-wide adventure tourism infrastructure that would include a trail across the state for activities such as horses, ATVs, hiking and mountain biking. On Thursday, Mongiardo gave assurances that the plan would not affect sensitive natural areas, but organizations such as the League of Kentucky Sportsmen and Sierra Club worry that the trail would cross wildlife management areas and nature preserves. In the Lexington Herald-Leader, reporter Andy Mead cited the new director of adventure tourism for Kentucky as declining to rule out the possibility that these areas could see later development, saying that trails would not be created in these areas that he could foresee. Faced with a growing energy crisis, the Bureau of Land Management finalized a plan on Thursday to open nearly 2 million acres of public land in Wyoming, Utah and Colorado to commercial oil-shale development. The shale could yield around 800 billion barrels of oil. Though actual development of the vast resources is likely a decade away, officials in Wyoming and Colorado are questioning the decision by BLM to proceed. An Associated Press article cites a written statement by Sen. Ken Salazar, D-Colo.: "The administration is putting the cart in front of the horse by trying to sell these leases prematurely." Lawn care just got a little greener. Yesterday, the Environmental Protection Agency set stricter emissions standards for gasoline-powered lawn mowers. Boat engines were also affected by the policy change, which EPA estimates will save 190 million gallons of gasoline each year. The boating restrictions will go into effect in 2010, while lawn care standards will be enforced the following year. The press release says that "the rule opens another chapter in EPA's success story of curbing emissions from non-road sources. EPA has recently set stringent emission standards for farm and construction equipment, off-road recreational vehicles, and for locomotives and commercial marine sources." As soldiers come home from tours in Iraq and Afghanistan, the physical injuries they face are sometimes less challemnging than the mental exhaustion caused by lack of sleep. Veterans' health is a rural concern because troops come disproportionately from rural areas. About 36 percent of Army troops who have been back for a year complain of feeling tired during the day, and another 34 percent say they difficulty falling asleep or staying asleep, Jia-Rui Chong writes for the Los Angeles Times. Researchers at Walter Reed Army Medical Center found that sleeping/waking problems were the most commonly cited health issues returning soldiers were facing. Soldiers returning to the U.S. must confront the challenges of redefining a routine and fitting back into civilian life. Mitch Hood, 25, battles nightmares and 18-hour days since he's returned, supporting himself on energy drinks and caffeine pills. Bill Rider, a Vietnam veteran, is all too familiar with the signs of exhaustion, having suffered from the same trauma and fatigue after returning from duty 40 years ago. He helped found a combat support group in 2001 and insists that, "Sleep deprivation ... is an ongoing discussion," particularly for victims of trauma and veterans, he told Chong. Many veterans seek help from painkillers and sleeping pills, but the risk of prescribing medication for soldiers suffering from Post Traumatic Stress Disorder is high. "Up to 60 percent struggle daily with substance abuse," Dr. Tasha Souter, medical director of the Trauma Recovery Program at the VA Palo Alto Health Care System, told Chong. Click here to read more. Of the nearly 400 suspected illegal immigrants were held during the May raid on the Postville, Iowa, processing plant, 300 were charged in criminal court. By contrast, only eight have been charged in the Laurel, Miss., raid that saw 600 detained, a move that may signal a shift in the Bush administration's approach to illegal immigration. The Washington Post's Spencer S. Hsu reports that the Postville process raised questions about due process from criminal defense and immigration lawyers. Most of those charges resulted in five-month sentences. By contrast, most of those detained in the raid at Howard Industries in Mississippi faced civil deportation proceedings instead of criminal charges. When businesses begin to shut down, the health of a small-town economy often follows. In South Dakota, a new fellowship program seeks to bolster rural economies by providing financial support to struggling businesses. The Dakota Rising program gives out eight fellowships to small business owners struggling to remain afloat in small communities in four designated areas across the state. The money can be used to help businesses expand into surrounding communities, create jobs, and attract outside businesses to the area. A recent proposal at the Federal Communications Commission may make it a little harder for rural residents to get good cell phone reception. The Universal Service Fund allows for the construction of cellular towers throughout rural areas where many carriers do not see construction as economically viable, but the FCC has suggested drastic cuts. Maurice Ouellette, a member of the York County, Maine, sheriff's office, argues in the York County Coast Star that these cuts will jeopardize public safety, saying "Public safety officers like me depend on wireless service to respond quickly to emergency situations. We rely on cell phones to assist in search and rescue operations, address domestic violence situations, prevent criminal activity and communicate in areas where police radio is unsecure or unavailable." Ouellette adds "Unfortunately, the FCC placed a cap on the wireless portion of the service fund earlier this year, and now proposes drastic cuts that could eliminate nearly half the support we now receive in Maine. Statewide, we could lose more than $6 million in annual Universal Service Fund support, and dozens of new cell sites would be canceled or delayed every year." (Read more) Ouelette refers readers to ConnectingRuralAmerica.org, which is opposing the proposal. Alternate delegate Monte Shaw, the executive director of the Iowa Renewable Fuels Association, told Ed Tibbetts of southeast of Iowa's Quad-City Times that the plank is no big deal because previous platforms have said likewise. But Jason Hancock of the Iowa Independent wrote, "The move is a major change from the 2004 platform, which supported expanding the use of ethanol as a way to reduce dependence on foreign oil and increase revenue for farmers." Iowa Secretary of Agriculture Bill Northey objected to the plank, and told Tibbetts today that the measure and John McCain’s other stands on agriculture issues could cost him votes in farm country: "I think it’s possible. We’ve got another couple months to play out. It does depend on what he says [from] here on out." Northey added that trade and regulation could also play a role. "He says McCain is better than Obama on those issues," Tibbetts reports. McCain opposed the latest Farm Bill, while Obama supported it. Alaska Gov. Sarah Palin cited her rural roots in her speech to the Republican National Convention tonight. "I had the privilege of living most of my life in a small town," Palin said. "I was just your average hockey mom, and signed up for the PTA ... because I wanted to make my kids' public education even better. When I ran for city council, I didn't need focus groups and voter profiles because I knew those voters, and I knew their families, too. "Before I became governor of the great state of Alaska, I was mayor of my hometown. And since our opponents in this presidential election seem to look down on that experience, let me explain to them what the job involves. I guess a small-town mayor is sort of like a 'community organizer,' except that you have actual responsibilities." Democratic nominee Barack Obama began his career as a community organizer on Chicago's South Side. Palin also alluded to Obama's remarks about small-town voters clinging to religion and guns. Palin reiterated that she opposed the "Bridge to Nowhere" to be funded by a congressional earmark, despite recent news stories that revealed her initial support of the appropriation as governor. She took this shot at news coverage of her: "I've learned quickly, these last few days, that if you're not a member in good standing of the Washington elite, then some in the media consider a candidate unqualified for that reason alone." That brought a large chorus of agreeable boos from the Republicans in St. Paul. UPDATE, Sept. 8: McCain's latest TV commercial gives Palin equal billing and says "She stopped the Bridge to Nowhere." Calvin L. Beale, a senior geographer-demographer with the U.S. Department of Agriculture who concentrated much of his research on rural population trends, died of colon cancer on Monday in Washington. He was 85. Beale "was among the first to recognize the transformation of America’s rural landscape from farms to a mixture of farms, industry and vacation homes," reports Felicity Barringer of The New York Times. She writes that Beale "developed a cult following among his peers. They marveled not just at his mastery of the theoretical tools, but also his first-hand feel for rural America." Beale was a major speaker at "Rural America, Community Issues," a 2005 seminar programmed by the Institute for Rural Journalism and Community Issues at the Knight Center for Specialized Journalism at the University of Maryland. Beale, who began working for the USDA in 1946 and was still on the payroll, was the agency's longest-tenured employee. In 1953, he got a job as a demographer in the Department's [then] Bureau of Agricultural Economics. His rural population theories were statistically based on his own model of nine stages of rurality, widely known as "Beale codes," along with his extensive travel within the U.S. Of 3,140 counties in the nation, Mr. Beale had visited 2, 500 at the time of his death. An accomplished author, Beale wrote a collection of writings about his travels in A Taste of the Country, published in 1990. Among the entries, he includes snapshots of little-known U.S. history he encountered, such as a mixed-race people called Melungeons in central and southern Appalachia, Barringer writes. For the rest of her story, click here. For a short USDA profile of Beale, click here. UPDATES, Sept. 15: The Washington Post ran a delayed but lengthy obituary on Beale, by Matt Schudel; the Milwaukee Journal Sentinel ran a tribute by Bill Glauber, which pointed out that USDA officials tried to suppress Beale's finding that the number of farms was dwindling; and Julie Ardery of the Daily Yonder noted other accomplishments: "Beale’s statistical studies of U.S. populations, especially our migrations from country to city (and, sometimes, back again), helped Americans stand back from the flux of 20th century experience, the better to see how the nation was changing." 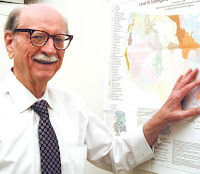 (Read more) Sept. 21: National Public Radio's Howard Berkes has a long story about Beale and how he helped change federal policy, accompanied by a Jim Wildman video of Beale from five years ago and a map showing the counties whose courthouses he photographed. Don't let his age fool you. The founder of the Institute of Rural Journalism and Community Issues, Al Smith, 81, is being honored this week by the Society of Professional Journalists - among the likes of late political journalist Tim Russert - and he has no intention of slowing down. Smith's formidable career has taken him to a variety of journalism positions, beginning with editor and publisher in both Eastern and Western Kentucky small-town newspapers. He went on to head the Appalachian Regional Commission under two U.S. presidents, worked as a host of KET's "Comment on Kentucky," founded the IRJCI at the University of Kentucky and continues to advocate for better higher education opportunities and solutions to rural issues. In Atlanta this Saturday, Smith will be recognized for his endless contributions to the journalism industry and be named a Fellow of the Society, SPJ's highest honor. For a column on Smith, by Tom Eblen in the Lexington Herald-Leader, click here. "Mr. Future President, please eradicate black lung," Appalachian writer Betty Dotson-Lewis writes in an open letter for the Daily Yonder. The first laws designed to combat the condition were passed almost 40 years ago, and specialists in the disease thought the law would make them find another line of work, but 30 years later miners are still developing black lung, and one expert "is now seeing evidence of black lung in younger and younger miners," Lewis writes. "One expert explained black lung to me this way: The lungs become petrified. They are cut to pieces by the coal dust inhaled. The miner coughs, hacks flem, spits and can’t breathe. There is no cure for black lung – death is the only way out. ... Black lung slowly strangles its victims. Black lung kills many more coal miners than explosions or cave-ins." Rural electric cooperatives are meeting in Indianapolis to discuss a looming energy crisis. Due to rising demand for electricity in their territory, much, of it suburban, "The rural utilities are calling for government to help clear the way for new power-plant construction, alternative energy facilities like wind farms and new transmission lines to feed energy to cities where most of it is used," writes Jeff Swiatek of The Indianapolis Star. "Industry predictions show that if U.S. electric producers don't build new plants or encourage significant conservation, they will be unable to handle peak demand periods from electrical users by 2012." In response to this crisis, "Duke Energy started construction this year of the first major power plant to be built in the state in 20 years. The $2 billion, 630-megawatt coal-fired plant [in Indiana] also would use new technology that aims to reduce air pollutants significantly over a conventional coal plant," writes Swiatek. Energy providers like Duke will be forced to raise rates by as much as 20 percent in coming years to pay for the construction of such plants. Bruce Graham, chief executive of the Indiana Statewide Association of Rural Electric Cooperatives, was encouraged by Duke's move. But the construction of the plant and the support for it point to the continuing dependence of rural electric cooperatives on coal as their most significant producer of electricity, about 80 percent of it. A recent post here discussed the financial support given by rural electric cooperatives to the coal industry to help ensure the construction of new coal-fired plants. In July, The Rural Blog highlighted a report on the growing divide between grant money given to urban and rural areas, so we're obliged to report examples of a charitable organizations targeting rural. One such example is a new initiative by a foundation focused on improving health in eight rural counties around Rochester, N.Y. In the past, the Greater Rochester Health Foundation has mainly targeted urban health initiatives. The foundation has now set aside $1.5 million over the next three years to create free dental clinics, fight obesity, and monitor water safety in rural areas, in addition to its work in urban Rochester. The foundation's president, John Urban, told the Rochester Democrat and Chronicle, "In talking with people in those counties, it was very clear that, while they had many of the same issues that Monroe County has, they're really accustomed to working on the issues in different fashion." At a time when many regional newspapers are cutting Washington coverage, a new study reminds us that a strong local press, including coverage of Congress, is needed to keep government accountable. It also tells us something that we haven't heard before: Such coverage can pay dividends back home. The study, "Press Coverage and Political Accountability," shows a significant overlap between press coverage and the effectiveness of elected officials. When a paper's coverage area corresponds with congressional districts, increased reporting on representatives not only gives constituents more knowledge, it increases the amount of federal spending brought into the districts. It also encourages bipartisan efforts and increases representatives' likelihood of participating in congressional hearings and may prompt them to serve on more committees. John McCain's surprise pick Friday of Alaska Gov. Sarah Palin as the Republican vice presidential candidate has had reporters scrambling to dig up whatever they can on the relative political unknown. A long weekend of revelations and speculation culminated in Palin's Monday disclosure that her 17-year-old daughter was pregnant, following rumors that Palin's five-month-old son was actually her daughter's child. It's a hard introduction to the national political media for Alaska's chief executive, who has been accustomed to a more small-town, rural environment. Politico.com media reporter Michael Calderone contrasts the congenial relationship Palin held with Alaskan reporters with the intense scrutiny she has already faced from the national political press corp in the days since she joined McCain's presidential ticket. In Alaska, Calderone writes, "Relationships were like those in a small town, where the neighbors may know your dirty laundry, but the local paper would be unlikely to splash it on the front page." With the average veterinary student graduating $120,000 in debt, the temptation to work in higher-paying fields after graduation is often irresistible, leaving certain lower-income regions and non-traditional veterinary fields critically understaffed. Also, many states are running short of large-animal vets. A new initiative in Pennsylvania seeks to address the shortage in critical areas of the Keystone State. The Pennsylvania Veterinary Medical Association recently launched Project Pennsylvania, an initiative to increase the number of graduates with a targeted loan forgiveness program, which would eliminate a portion of the debt for every year served in one of the eligible areas. The initiative also focuses on actively recruiting students interested in these areas, and providing on-the-job mentoring. "New data indicate that more than 13 million children are living in poverty, 22 percent of rural children and 25 percent of children living in central cities," says the Carsey Institute at the University of New Hampshire. "The report, based on U.S. Census Bureau data released today, finds that on average, rates of child poverty are persistently higher in rural parts of the country relative to suburban areas and share similar rates with many central cities." Sarah Savage, a research assistant at Carsey, writes "Because poverty is closely linked to undesirable outcomes in areas such as health, education, emotional welfare, and delinquency, we take child poverty seriously as a measure of children's well-being." One solution to the chronic problem of odors from chicken houses is to plant trees around them, according to research by the University of Delaware. "Planting just three rows of trees around poultry farms can cut nuisance emissions of dust, ammonia, and odors from poultry houses and aid in reducing neighbor complaints," Science Daily reports, citing work by George W. Malone, an extension poultry specialist with the university. Science Daily adds, "Malone's team suggested that planting vegetation could reduce ammonia and particulates that may degrade surrounding air and water quality. . . In a six-year study, Malone and his team found that a three-row plot of trees of various species and sizes reduced total dust by 56 percent, ammonia 53 percent, and odor 18 percent. The approach is being adopted around the Delmarva" Peninsula -- parts of Delaware, Maryland and Virginia. Demand for goat meat is growing in the U.S., making goat raising more popular. 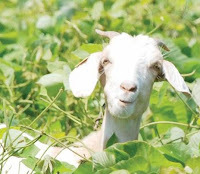 And as some wonder if goat farming could provide a valuable source of income for families in need, some Kentuckians are using the animals to control undesirable plants such as kudzu, an invasive species that grows throughout the South. The husband-and-wife team of John Cheves and Janet Patton at the Lexington Herald-Leader delivered a one-two punch today to Senate Republican Leader Mitch McConnell of Kentucky, casting him as a leading protector of an industry that is cruel to horses but says it is cleaning up its act. McConnell, who is running for his fifth term, "pressured the U.S. Department of Agriculture for years to back off its enforcement of the Horse Protection Act, even threatening to cut the agency's funding," thus supporting the Tennessee Walking Horse industry in its battle against USDA inspectors who look for evidence of soring, the illegal practice of deliberately injuring a horse's front feet to get it to step higher," Cheves reports, adding that people in the industry give to McConnell's campaigns. Editor John Philleo of the Times-Gazette in Shelbyville reported last week on the increased USDA presence. Lonnie Messick, executive vice president of the National Horse Show Commission, which sanctions the Celebration, told him that 96 percent of exhibitors were found to be in compliance. For Philleo's comprehensive 1,300-word story on the long-running controversy, click here.